From the moment you meet your 'one', the one who you will spend your forever with you, and particularly from the point of your engagement, you build together so many hopes, dreams, and expectations for your wedding day and married life. But does the reality live up to imagination? 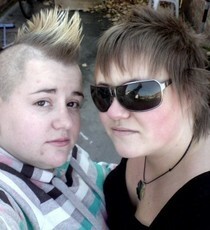 Kirsty (29) and Clara (23) have been together five years and married in October 2010. They are expecting their first baby in August! How did you and your wife meet, and what was it you liked about each other? 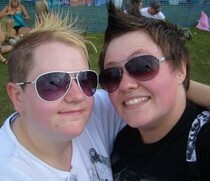 We met on the website Gaydar Girls - I messaged C as she mentioned on her profile that she hated mushrooms and so did I! We got talking and eventually we decided to meet for a drink, after that we were pretty inseparable. I was very different to the usual type C weren't for as I had a mohawk and was a lot more butch than she was used to, but I think she decided to try something new, haha! She is beautiful and very funny - she can make me smile with just a few words. We spent pretty much every moment with each other - we couldn't bear being without each other. We both had started to think about getting married but hadn't spoken about it. C proposed on the beach at Brighton Pride. The sun was setting, the waves were lapping up the stony beach and we were sat holding each other. She asked me, and of course I said yes. Afterwards I let her know that I had been seconds from asking her too. It was everything we wanted and more. 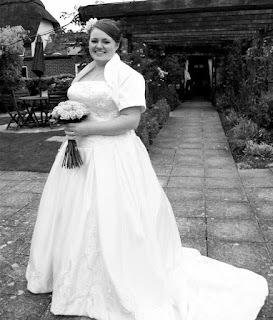 C had put a lot of planning in to our wedding - she was amazing, I saw a side to her I'd never seen before. 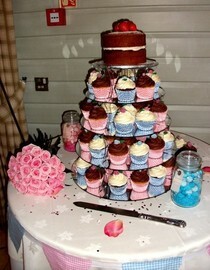 We went for a shabby chic theme as our location was a gorgeous little inn in a sweet little village in Dorset. We had the ceremony in a lovely little room then moved into the next room for an amazing dinner. The moment I set eyes on C walking down the aisle, I had to bite the inside if my cheek to stop me crying, she looked so beautiful. The day seemed to pass by so quickly but luckily we managed to sneak away together for moments to take it all in. It was the best day of my life so far. Have your family been supportive? They have been fantastic. I think at first when we announced our engagement, everyone was a bit apprehensive as we were planning to go to Australia for a year. But we moved from London to Dorset and decided it was the right time to confirm our love. Our family still continue to be very supportive. 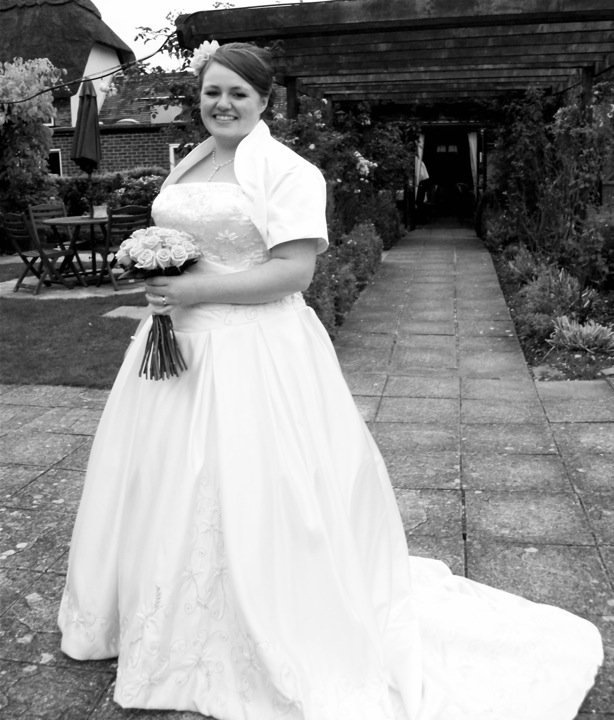 Do you feel anything made your civil partnership different to a wedding, or do you think society feels it's different? I think our day felt, looked and was a wedding. To us the only difference was the crappy certificates you get at the end, they looked like something printed off PowerPoint! How has marriage changed your relationship and you as people? It's a cliché, but I think we are much better people now. I would do anything for C and know she would do the same. 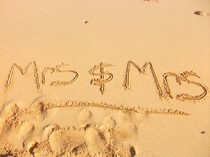 It's an amazing feeling, knowing that there is someone you want to spend the rest of your life with - we are soul mates. This year we celebrate our two year anniversary in October and we will have a little person added to our family - I can't wait! Thankyou so much to Kirsty and Clara for sharing their special day with us - lovely to hear from a couple who like us, got engaged in Brighton! Your wedding photos are beautiful and captures the love in your eyes perfectly. We wish them many more years of happiness, and are excited to hear all about their journey to parenthood! Stole this photo from their blog cos we love it - hope they don't mind! Awesome! I follow their blog and loved reading your feature blog on them today! 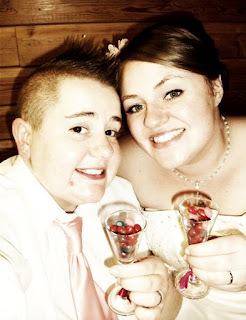 Thank you for sharing our story :) can't wait until we get to see your wedding pictures.